Rats are very nice pets, despite their bad reputation. They are quite intelligent, clean and "low-maintenance". Few people know that pet rats (fancy rats) are to wild rats what a German Shepard Dog is to a wolf: they look similar but are different. 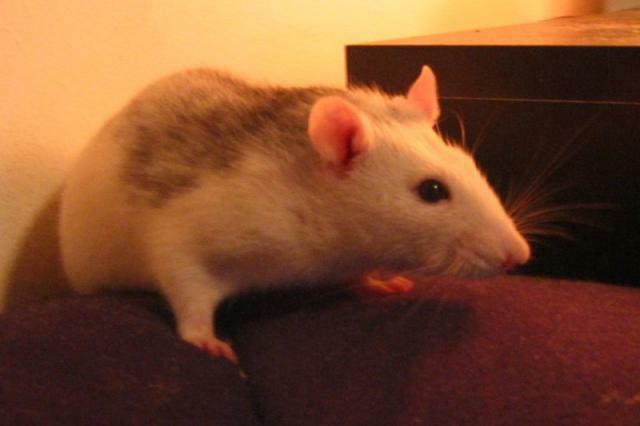 Pet rats are domesticated wild rats. They differ from wild rats in their appearance and also in behaviour. Nevertheless it's so deep in peoples' heads that rats are dirty disease spreaders, which just is completely false. And a lot of people find the naked tail disgusting. But Regina and I love rats: they make very nice pets. They look very cute (IMHO), are intelligent (which can also be problematic), are very social animals and don't require costly equipment (you can build a cage for yourself). The only real problem is that they are rodents, and rodents like to gnaw on things. But on the other hand, cats and dogs like to destroy your furniture as well. I recommend reading the Wikipedia entry for pet rats (german entry). We have a gallery of our rats.